Being safe and comfortable are necessary components for your family at home. Unfortunately, the buildup of matter in your central air conditioning unit may be putting both key elements of your home at risk. The inspection and cleaning of central AC ducts and systems help to clear your home or business’ air of debris which may put health at risk. And, it helps to keep your system running efficiently and effectively all year long! When is the last time you’ve had your AC unit inspected or cleaned? There is visible mold growing in, on, or around the central air conditioning or heating unit. Also, if there is suspected mold growing in the unit, inspection performed on the unit beforehand can help to determine which type of mold is affecting your system and how to go about proper and safe removal. Furthermore, it’s important to understand that when there is mold, there is something which is encouraging and allowing its growth. So, cleaning of AC systems can help to determine what is causing mold so that it can be prevented from accumulating in your ducts in the future. Air conditioning ducts have been previously infested with pests such as rodents or insects. Ducts are releasing particle matter when the unit is turned up or on. There is a development of dust or other waste within the unit. The AC/Duct Cleaning Process with A Plus Mold Remediation Inc. Whether you need your AC ducts cleaned due to one of the reasons mentioned above or want them cleaned as part of your routine home maintenance, A Plus Mold Remediation Inc. can help! Our expert AC and heating system cleaning experts utilize methods and procedures based on EPA and OSHA standards and regulations. That means we won’t use any harmful chemicals when cleaning your system. In fact, we only utilize a safe and innovative HVAC system vacuum machine which works to effectively clear the registers, ducts, coils, blower, and air handler of the unit. No matter how big or small the job, A Plus Mold Remediation Inc. has an AC cleaning solution which can meet your needs. Not only are we experts at what we do, we usually complete cleaning jobs in as little as 2-3 hours. 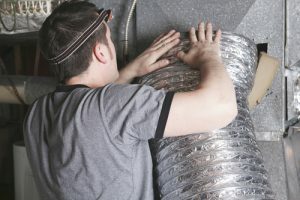 If you know how many ducts you have and how big the establishment the HVAC system is located in, we can provide you an estimate for AC duct cleaning services over the phone today! Give us a call at (561) 247-3506 to learn more!